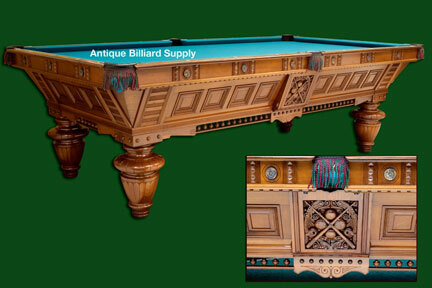 #4-07 Custom Victorian Brunswick antique pool table from the 1880s. Constructed of solid cherry planks, this table features elaborate use of carvings, turnings and hand-fitted panels. The round, fluted legs are accented by the numerous turnings along the bottom of the cabinet. Detailed hand-carved panels on each side show cue sticks, and pool balls amid garlands. Likely a limited-edition model by the J. M. Brunswick & Balke Co. Nine-foot, regulation size. Matching cue rack available. Investment grade restoration. Ready for immediate delivery. Priced in the 60s.